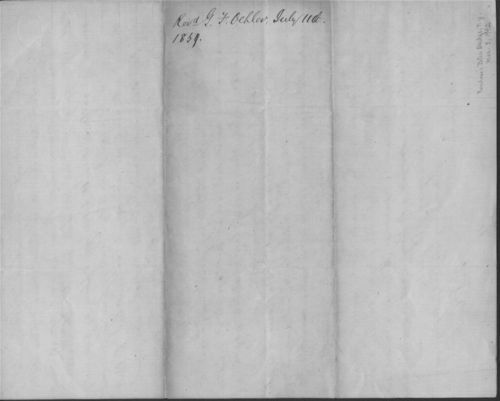 Gottlieb F. Oehler, a Moravian missionary working with the Chippewa and Munsee Indians in Kansas Territory, wrote this letter to Eli Price regarding the mistreatment of Indians and whites' disrespectful attitudes toward Indian lands. Oehler was appalled that white squatters frequently settled on Indian land with no response from the federal government, who should have protected Indian land claims. While most white Americans agreed with the government's approach to removal, Oehler hoped that Price would speak out against federal policies and educate the public in the eastern United States about the treatment of Indians out west. This source demonstrates how some whites sympathized with Native Americans and wanted to reform the federal government's policies towards Indian lands. It also illustrates how some Americans (particularly in the eastern U.S.) were unaware of how Indians were being treated in Indian Territory. This could be paired with the letter by Amelia Labedia, which was also chosen for the 7th-grade standard.